This morning I took my oldest out this morning on my run. The plan was for me to do intervals, I decided to take him with me since it was something I could do at the track. He was so excited to get to go running with me this morning, he had his clothes all laid out the night before. We headed over to the track to get started. He did great, didn't complain and just kept going. He is looking forward to his next run- he'll be doing the ASYMCA Mini Mud Run along with one of my other boys in August. 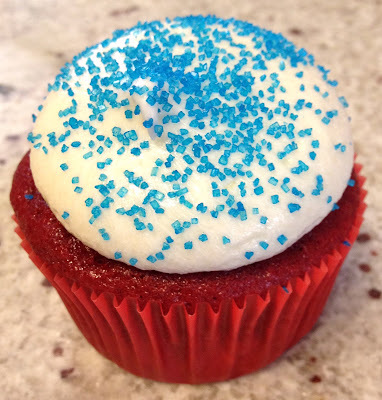 Today we also celebrated a deployment milestone, and my oldest had requested red velvet cupcakes with cream cheese icing so after dinner we sat down with cupcakes.... As my fellow cupcake runner Run Find Your Happy Pace says "will run for cupcakes!" They were a hit! Great Job kiddo! And the cupcakes were YUMMY!! Thanks for sharing. And great Job to Mommy, you are almost there!! !